these work as needed and add an extra 6 ft to your gaming distance, great when you have a decent sized tv. quick shipping and happy buyer. also, these are a tight fitting in the n64 which is ok since i dont need to plugin/plugout ever and the connection between controller and extension work great as a break away incase someone walking front of you and pulls the cord, disconnects without yanking n64 of the entertaintment center. Good if you need the distance. But with any wireless device or extention cord there is that 1/4 sec. Lag time on responce. So good for mario cart/ bad for smash bros. Over all i needed the distance. So good product. I can play N64 from my couch without having to search for a good battery that comes with wireless controls. Very happy I went with extensions. Don't have to sit on the floor to play 64 anymore. 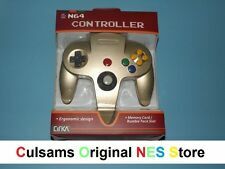 Must have if you have an N64. The BEST thing I ever bought!! !